I must say I am impressed!!! plans and activities that have already started for next year's GeoWoodstock. of us making the trip to Cincinnati!!! 2) A new, Official, Greater Cincinnati GeoTour is currently being built! 3) The OCB, Original Can of Beans will be at the event. because the guy who owns it is retiring it!!! 4) Camping with a Friday night bash is coming. It is a massive buy/sell/trade exchange of geocoins. 6) The VIP registration will have MORE THAN 20 minted pieces. 7) First 5000 people get a free trackable. 8) We are expecting to go Giga! This is an event that expects to bring 5,000+ people. several GeoTrails with coins in the area. 11) Registration and hotel bookings can be found on the website. 12) The venue does have free WiFi. and will announce it soon - it will be within 25 miles. the other events will be other events most likely at the fairgrounds. I will publish more info here as I receive it. more info on that event in my next blog! 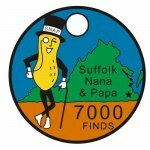 Labels: #geocaching, #gogeocaching, Geocache, Geocaching, Geocaching blog, Geocaching Hampton Roads, GeoWoodStock, SNAP, SNAP!!! The night caches are all within 35 miles. Most are within 20 miles. Other than that, everything else is very accurate.